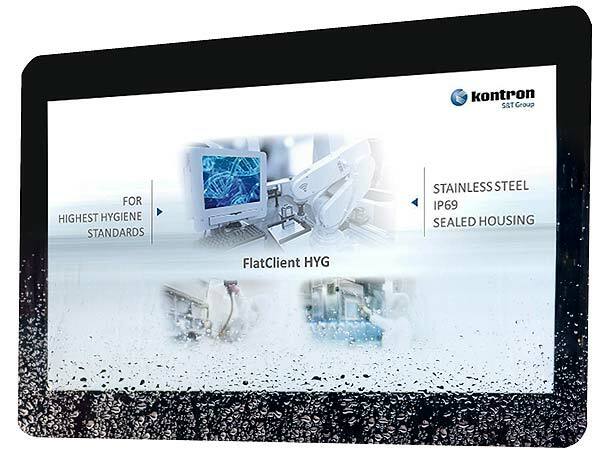 Kontron, a leading global provider of IoT/Embedded Computer Technology (ECT), is introducing the FlatClient HYG. Designed according to EHEDG guidelines (European Hygienic Engineering and Design Group), the latest member of the FlatClient Panel PC family features a maximum protection class with IP69K. These specifications qualify the new FlatClient HYG for use in sensitive hygienic scenarios, in the food and pharmaceutical industry as well as in clean rooms of semiconductor manufacturing plants, in optics and laser technology, life sciences and nanotechnology. The robust basic design enables operation next to dirt-generating manufacturing machines. In addition to the Panel PC series, the new family of HMI products also includes an industrial-grade monitor version with up to IP69K, the FlatView HYG. The FlatClient HYG with a stainless steel housing and a support arm is IP69K protected. A cost-optimized system variant with VESA 100 offers IP68 protection and enables power cabling via M12 connectors or cable glands. All versions have a smooth, seamless display surface for perfect cleanability. Its IP69K protection makes the new Panel PC also suited for washdown applications like high-pressure cleaning. The PCAP touch display clearly distinguishes legitimate control inputs, even with gloves, from errors like the impact of water drops (water drop rejection) or the accidental touching of the display with the entire palm of the hand (palm rejection). The FlatClient HYG was designed and built in Germany; extensive inhouse support is ensured. Like all Kontron HMIs, the Panel PC is available on request as a white label version with the customer’s logo and branding. The FlatClient HYG can be perfectly adapted to customer requirements: due to its symmetrical design, the 21-inch Full HD display can be operated in both portrait and landscape format. Display sizes of 15.6 to 23.8 inches with resolutions between 1366×768 and 1920×1080 Full HD in 16:9 or 16:10 wide format are available. All versions are also consignable with high brightness displays. More adjustments to special light conditions by additional measures like anti-glare and/or anti-reflex or UV and/or infrared protection are possible as are anti-bacterial coatings. The FlatClient HYG is also available with PoE technology (Power over Ethernet), enabling network connection and power supply of the Panel PC with just a single cable. This reduces the cabling and installation work to the absolute minimum. The ECO line is available with either Intel® Celeron® Quad Core(TM) J1900 or Intel® Pentium® Quad Core(TM) N4200 processors, the PRO line is available with Intel® Core(TM) i5-6300U or Intel® Core(TM) i5-7300U processors. The FlatClient HYG has 4 GByte DDR3 SO-DIMM RAM. Additional processor types, added memory or a SSD drive with up to 1 TB capacity can be configured. The relevant operating systems are Windows 7, Windows 10 IoT or Linux, depending on the version. In addition to two Gigabit Ethernet ports and up to four USB 3.0 ports, a broad array of interface options like two COM interfaces (RS232, RS422, RS485), one serial interface, profibus, CAN and other fieldbus connections are available to enable integration in any architecture. Integrated WLAN provides wireless network communicaton, while integrated RFID ensures contactless authentication. The FlatClient HYG is designed for fanless operation at temperatures between 0 and 50 degrees Celsius.